« Featured Art from PolyMarket Press Books! A good part of 2014 so far has been devoted to getting things set up and running at the new location. Kay Carol Gallery & Priscila Working Arts Studio often gets shortened to KCP Gallery, and is located at 364 Main Street in Longmont Colorado. I graduated with my Media Graphic Design degree in December and opened up a community arts workspace with Marcelo Fernandez in the same month. We were joined by Christina Cappelletti and had our Grand Opening in February. We function as a working studio space, a gallery, an emporium, a class and meeting space, plus we have musical and cultural events. Marcelo, Christina and I all work in graphic arts as well as other media and have our studios in house. We are able to work with artists and entrepreneurs to develop their websites, business cards, packaging and display needs, as well as offer a nurturing merchandising environment to try out new products and lines. We currently show the work of 48 artists, all but two of whom are local. Every month we have a different Featured Artist’s work displayed and a reception for the artist on the 2nd Friday of that month. In October, the artists of PolyMarket Press take center stage. There will prints and cards from Ricardo Acevedo’s books Night and Interloper. I will have beautiful and mysterious artifacts from Randee M. Ketzel and Kim Schlinke’s book Polymer Clay Gemstones-The Art of Deception. There will also be polymer clay artwork from my first books Create a Polymer Clay Impression and Celebrations With Polymer Clay. Mosaic musical instruments, wagons, and more created by Bryan Helm will be on display. 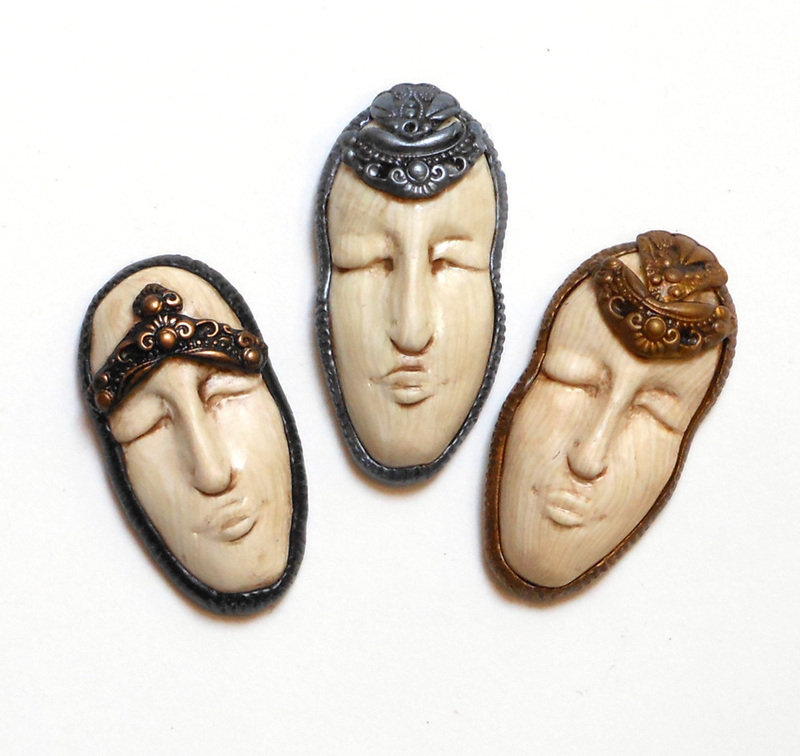 In addition, there will be hundreds of miniature masks from A Collection of Polymer Clay Masks including 200 collected since publication. We are mounting and framing our entire collection for this show, all made by polymer clay artisans from around the world who have participated in the Internet Miniature Mask Swaps for quite a few years now. Some full sized masks will also be part of the collection shown. 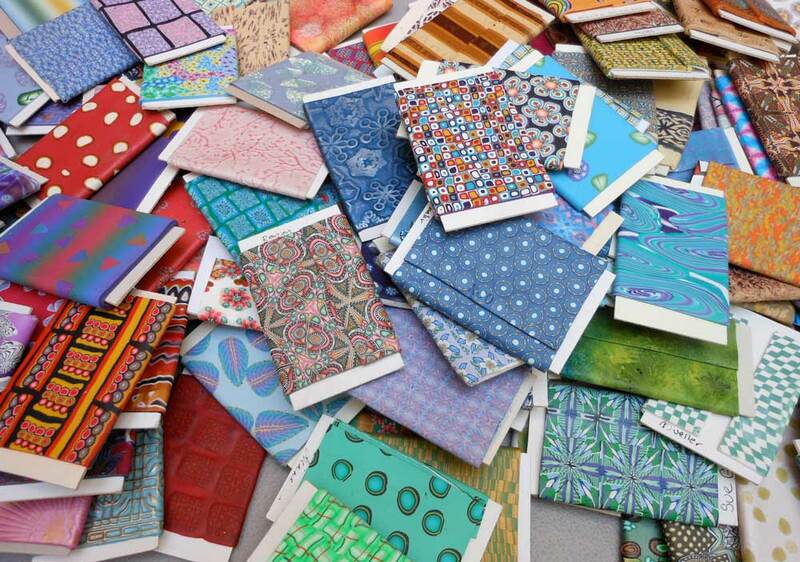 Rounding out what may be the world’s largest collection of small samples of polymer clay techniques are the “fabric bolts” and miniature quilt store from Adapting Quilt Patterns to Polymer Clay, the premier book from PolyMarket Press, written with Judith Skinner. The little store was stripped to the polymer clay tiled floor and re-done as a Barbie-sized store for perfumes, toiletries and accessories. The bolts are business card sized pieces of card stock wrapped in a piece of polymer clay that mimics fabric. I made quite a few patterned bolts and dozens of solid colors, but ran out of time while working on the actual book layout. Artists from around the world came to my rescue and contributed a bolt or two, or more, and helped fill the shelves of the miniature quilt store. In the pictures seen in the book, most of the bolt is obscured, as they are all together on shelves. Now, for the first time ever, all the bolts will be seen face-on. I’m mounting 240 of them in a quilt block pattern, and no two bolts are alike. Hundreds of techniques are on display–millefiore in a myriad of styles, inclusions, mokume gane, hand drawn or stamped, ripple-cut, extruded, and many more. The collection will be on display throughout the month of October at KCP Gallery.